Last year we heard a story about HIV researchers / circumcision advocates in Africa. Of course, being just a story, having no evidence, we didn't mention it. But the story seems to be now corroborated and will be presented at the AIDS 2014 Conference in Melbourne, Australia, July 20 to 25. "In one presentation I sat through at a world AIDS conference (summer of 2010), a young doctor with these circumcision campaigns [in Africa] (he was marketing chief) took to the podium and explained a "successful" program. They went into the poorest communities, where the boys were mad for soccer, and bought them all new equipment and uniforms. Built them beautiful pitches to play on. 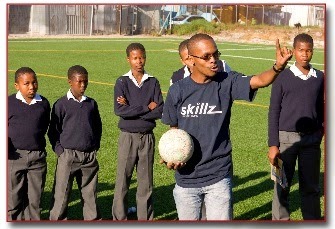 Brought in well-known soccer players to inspire the boys, and got coaches. Let the boys play and get to love it. And when it came time to play in the regional tournaments, the bar came crushing down: they'd be sponsored to travel and play only if the team captain could convince most of the boys on the team to get circumcised. The peer pressure was tremendous not to let the team and community down. This doctor was positively gleeful at how successful this strategy was." Presented by Zachary A Kaufman (United Kingdom). The title of the abstract reads "adult male football players". We are definitively interested in reading all the details. We will be waiting for the full abstract, to be made public next Friday. But now you know what to wait for. 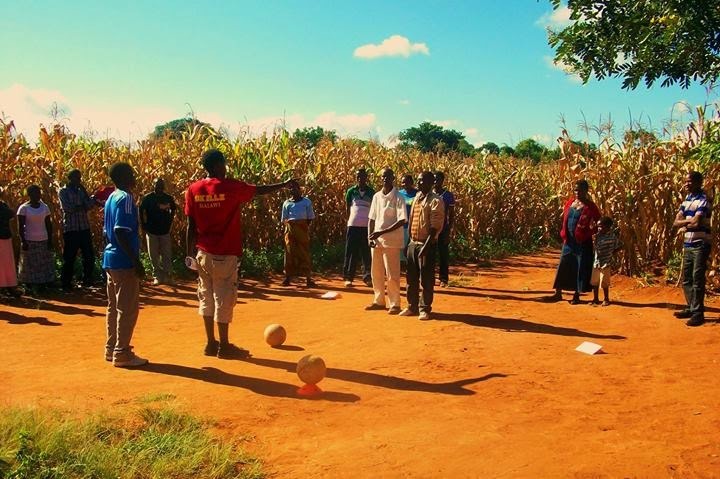 In the Mchinji District of Malawi, local Peace Corps volunteer counterpart and Grassroot Soccer coach Henry Ching'ombe, works with the Kamwendo Youth Group on the GRS activity "Cut and Cover," which addresses medical male circumcision. Notice that the photo mentions "Grassroot Soccer". This is an organization with the following explicit goal, according to their facebook page: "Using the power of soccer to educate, inspire, and mobilize communities to stop the spread of HIV"
The Bill & Melinda Gates Foundation and the Doris Duke Charitable Foundation (DDCF) are supporting Grassroot Soccer (GRS) in a unique and innovative randomized control trial in Zimbabwe that will assess the impact of an educational intervention using the power of soccer and its role models to increase awareness and uptake of medical male circumcision (MMC) as an HIV prevention measure. The trial, known as MCUTS (Male Circumcision Uptake Through Soccer), will target men ages 18-35 with educational outreach through soccer-related messages. [May 12th 2012, GRS Zambia] for the first time ever at GRS, we held mobile Medical Male Circumcision (MMC) at the school grounds. The procedure was conducted by Marie Stopes International (MSI), and was sanctioned by the Ministry of Health for outreach service delivery. There were four boys, between the ages of 16 and 24, who elected for the medical procedure. The operation takes between 25 to 30 minutes, and there is an additional pre and post counseling session dedicated to MMC. Each boy left the post counseling session knowing they now had 60% more protection against acquiring HIV. Participants found MTC (in particular the Coach’s Story) persuasive because the MTC coaches had been circumcised and could discuss the procedure. Future implementation should incorporate home-based follow-up and small incentives while avoiding delivery during the holidays and mid-season for professional soccer players.